I’ve been a fan of the Veloster Turbo from Hyundai since I drove the inaugural version several years ago through the winding canyon roads surrounding San Diego. I recently had the 2016 Rally Edition for a week and got to experience the vehicle again, this time with plenty of routine city and highway drive time along with some more challenging roads. The car is just as fun as I remember, though I do miss those SoCal roads. 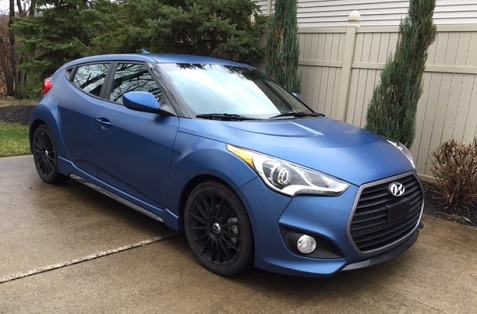 My Veloster Rally Edition came with Matte Blue exterior paint with black wheel rims that made the car stand out as I drove through town. The Veloster is still in its first generation, so there haven’t been significant design changes to the exterior, which still features the unique third door for easy access to the back seats. The unique look and body shape gives the Veloster more interior room, as the designers weren’t wed to tradition sports car dimensions, while the headlamps and large grille provide a powerful look for the vehicle. There’s plenty of room in the interior as I mentioned above, so you don’t get that cramped feeling you’ll find in smaller sports cars. It was very comfortable with extended city and highway driving. The leather seats with blue accents complimented the overall look of the vehicle, and I liked the B&M Racing Sport Shifter that’s unique to the Rally Edition. For 2016, buyers get new audio/navigation system functions such as HD Radio, Apple Siri and next-generation Blue Link. The Rally Edition offers sportier spring, damper and stabilizer bar tuning compared with the R-Spec Veloster. You also get RAYS lightweight 18-inch alloy wheels (5 lbs. lighter per wheel) and 225/40R18 performance all-season tires. The Veloster still sports a 1.6L Turbo delivering 201 horsepower and 195 lb-ft. of torque and six-speed manual transmission. I love the smooth shifter and the acceleration along with the tight grip the Veloster offers around curves. I had the Veloster in some bad weather and it performed nicely. The Veloster is the kind of car you can have serious fun with, but can also provide a very comfortable and practical daily driver. Gas mileage is 28 MPG combined with 25 MPG city and 33 MPG highway. 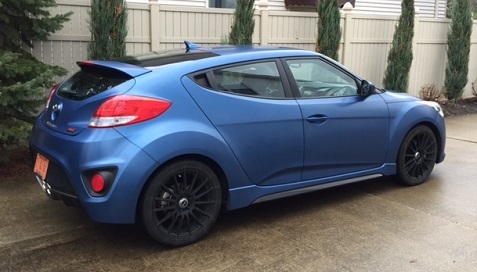 The Veloster Rally Edition is a limited production run planned for 1,200 units, all with the Matte Blue paint, unique badging and floor mats, offering buyers a more exclusive vehicle. This is a fun sports car that should appeal to a wide variety of consumers who expect a little more from their driving experience.